Unbound by agenda or necessity. 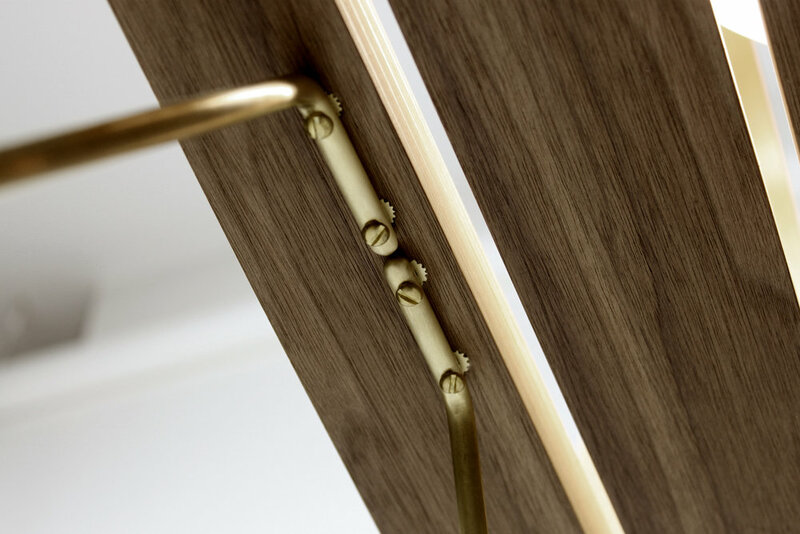 Expressions of form, a mesh of materials, a flora of function…existing only in limited editions, or singular works of art furniture. Without any hesitation, join the currents of fun, as furniture transforms from functional & fashionable, to playful & enlightening! Constructed entirely from curving bodies, DAWN stands bold and exposes her inner beauty with radiant force. Her surface is hard on the inside, while presenting a soft exterior... reaching out into the room with a comforting presence. Whether tucked away in a cozy corner, snuggled up to the beside, or arm-to-arm with the sofa, she remains poised for every morning coffee, evening read, or entertainment night. Her spirit will flow with you throughout the days, the weeks, and the years, as she lights up your life, day in and day out. Respect her presence, and in return, receive a warm embrace each and every day. Inbound is designed to lift you up, match, and augment your energy! When it’s time for a party or some timely ambiance in the evening, this table delivers, with soothing rings of light casting out into the room. With a shape indicative of bent wood, the backbone of this table is instead fashioned from a stack of solid wood profiles, offering up strength and longevity. The curved table ends eliminate sharp corners, providing a safe environment for small children, while a soft underbelly invites play! Hidden feet raise the table slightly off the ground, just enough to “lighten” things up. Upholstery surrounds the inner surface, providing relief for your tired feet, as you lounge on the sofa….or even better, a head rest as you explore your living room floor…drift off into meditation with a new perspective. The first Inbound table (from solid Walnut) went on display at the Vancouver Convention Center, for the IDS West 2017 'Prototype' competition, where it won the "People's Choice" award. It then went on display at Kozai Modern gallery in Vancouver, until May 2018. The second table (Maple) went on display Jan 18th at IDS 2018 in Toronto. This is...art, lux, moderne...and it's only just begun. Standing light on their feet, barely thicker than a nail, single slabs of raw material bend to the will of your living room. A tunnel for your kids…a tent for your pets, or simply a subtle curve to rest your feet up on. These tables hide their true strength - built from solid aluminum (100% recyclable), strong enough to stand on, yet light enough to move with ease. 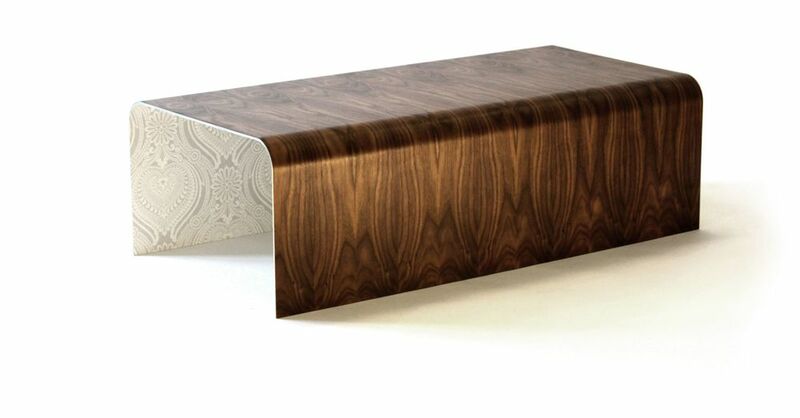 The patterns of hand picked wood veneers and heavy weight wallpaper, bring these streamlined forms to life. 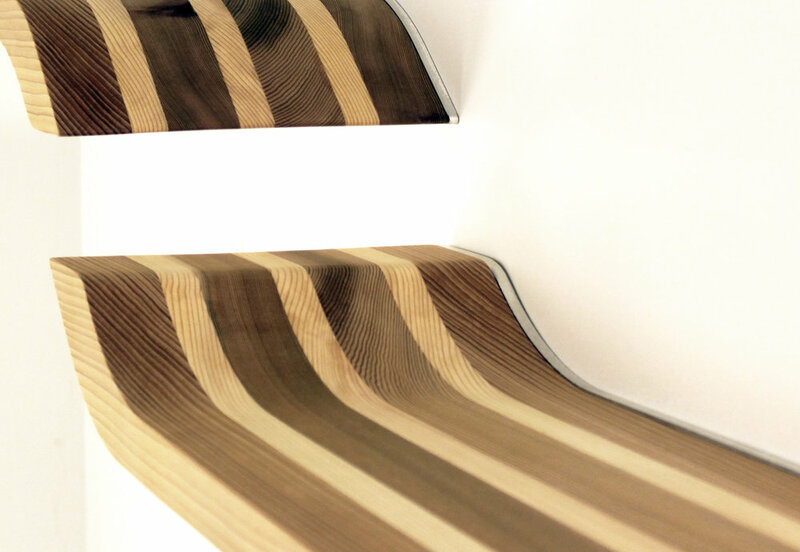 Follow the continuous wood grain from one side to the next, and you will never feel the same way about veneer! In decades to come, when this beautiful finish shows its age, or the wallpaper fades in fashion, this metal table can be stripped, refinished, revitalized, and passed down through generations. It's Sustainable. That's how we Aluminate! Designed to be a canvas for the creative eye, and customization - CHOOSE from a selection of veneer & wallpaper ...and Aluminate your living room. A single pair of shelves carefully spaced and mounted in alignment, represents the flow of two separate objects in harmony with one another, yet each beholden to carry their own load. Originally prototyped with fir studs reclaimed from a construction site, the design has evolved to be built from a combination of kiln dried cedar & pine planks. This choice of very light weight wood materials was critical to the design, freeing up the bulk of their weight capacity for carrying & displayed any of your valued collection of household items. Floating on the wall with hidden hardware, their continuous surface allows for inverted mounting, which opens up the possibility for various arrays and patterns along the wall. In essence you become the sculptor! Designed to illuminate your senses! 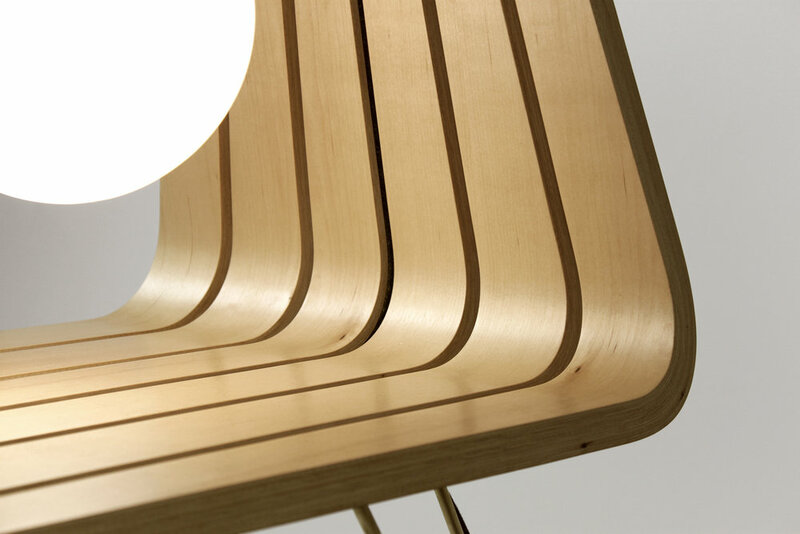 This flowing light form was made from solid acrylic, covered in walnut veneer. 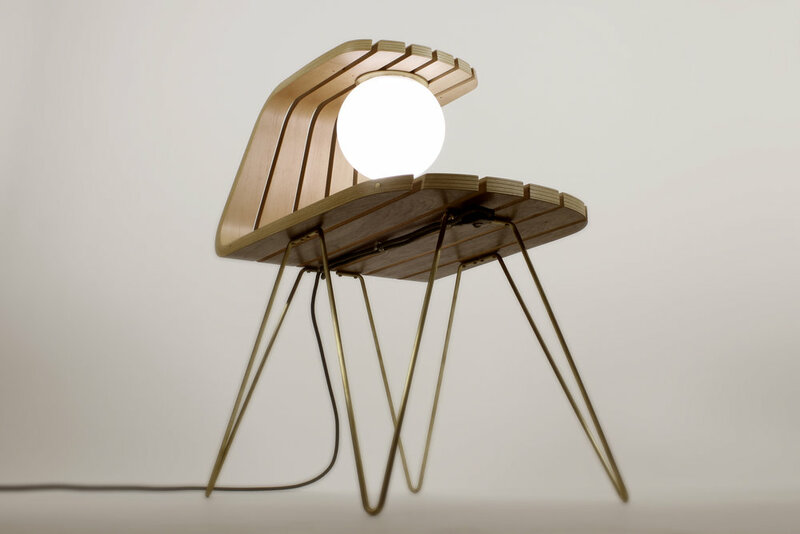 It combines the function of both a bedside table and reading lamp, into one stylish "lightstand". 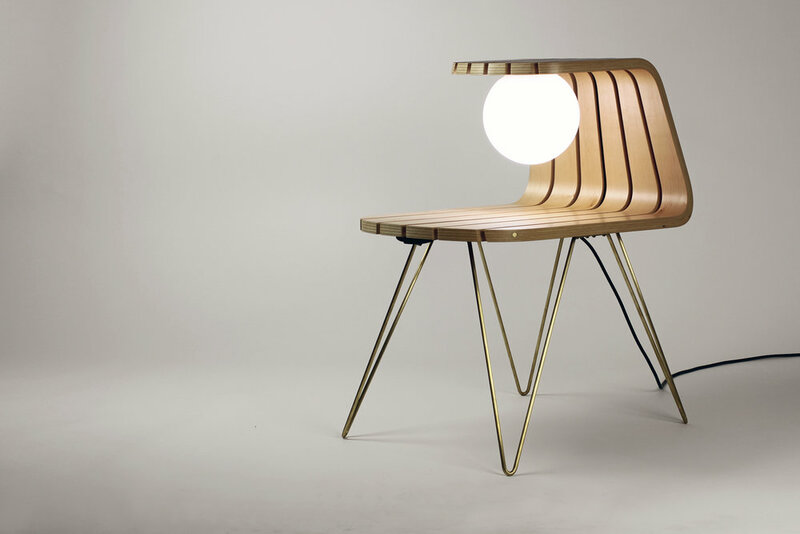 When lit, the entire edge of the shelf glows warm with light, providing ample light for reading or drifting off to. There's just a little bit of magic going on in this piece, and in the dark...we can feel it! Curved and molded to draw your eyes around the bend, it pulls you in, and demands your attention. 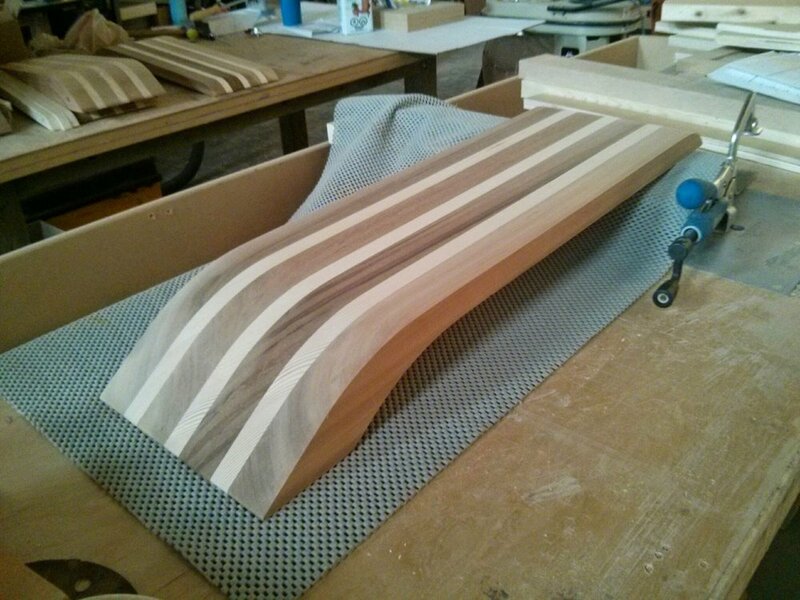 Built from bent plywood, Maple and Mahogany veneer, shaped and finished by hand. The motif in the hollow, symbolizes life and growth. The firm maple shell is hard and protective, backed by a softer rich mahogany beneath the surface. This wooden sculpture was the very first coffee table I built with my own hands - as an anxious, perfectionist, crafty, design student, near the turn of the century. A shout out to the shop tech at the time (Cam Firth) for master-mining the jigs needed to build this, before I knew how... and to my teachers (Tim Antoniuk and Jesse Sherburne) for orchestrating and championing an amazing trade show booth for IDS Toronto that year, allowing a small group of aspiring young designers from the prairies, the opportunity to show our work on the professional stage! ...THIS is where it all started! !